I make no secret of the fact that I hate consumerism. I rarely buy clothes for myself and if I do, they’re often from a charity shop. And as for designer items? They would have to be pretty special to turn my head. But I do make one exception. This isn’t one of those reviews where someone sends me a designer item and I tell you it’s wonderful. Instead, it’s a recommendation for a brand I’ve been using for years. 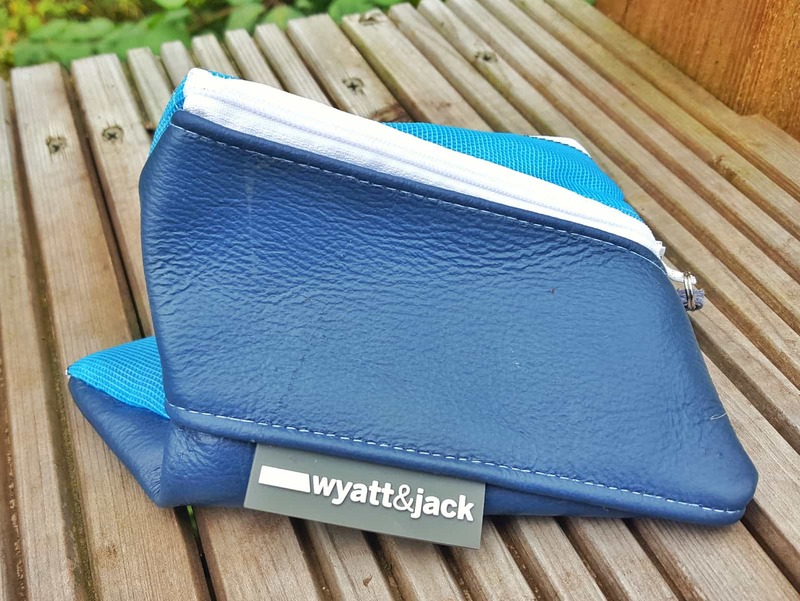 I first discovered Wyatt and Jack when I featured them as an ethical retailer. At the time, they sent me a little pouch made from a reclaimed deckchair. 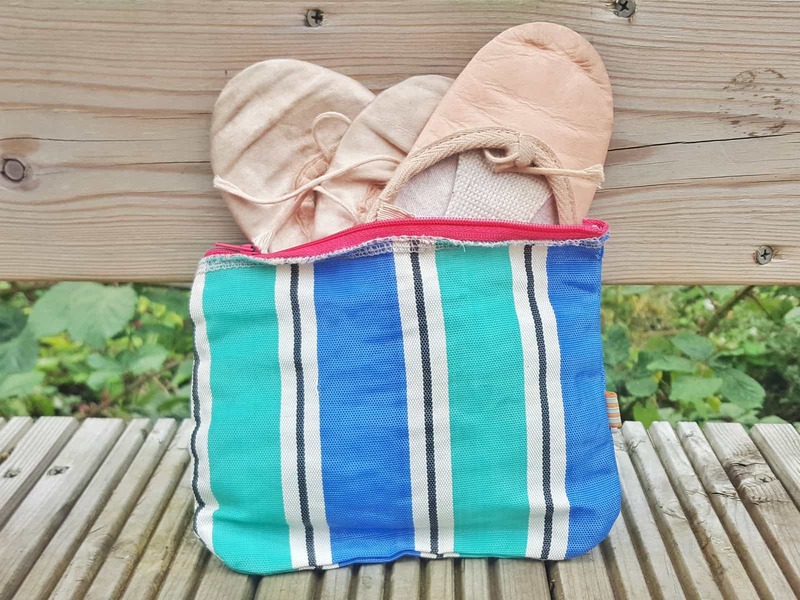 That was in 2015 and I still use it for the girls’ ballet shoes. Since then, I’ve had two handbags, one changing bag, a large tote that I use as a swimming bag and a wash bag from them. I’ve been to visit their shop and workshop in the Isle of Wight where I bought two of the bags. And now, they’ve asked me to review another bag. They’re basically just feeding my addiction. Well firstly, I love the bags. They’re quirky, hardwearing and totally unique. But more importantly, they are one of the most ethical companies I know. 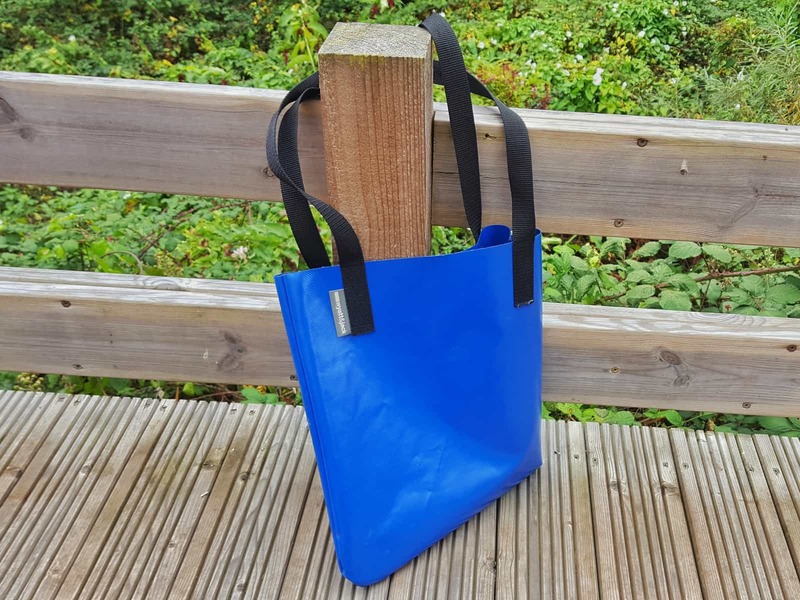 Their bags and accessories are sustainable and made from upcycled canvas from beach deckchairs, and vinyl PVC from retired bouncy castles. They source the fabrics from the UK, and the products are all made in Britain. I love the fact that over the years, Wyatt and Jack have varied their product line, but they’ve never compromised on their ethos. They do a variety of bags and accessories to appeal to different requirements and tastes. And the latest one I’ve been testing out is a bespoke handbag made especially for me. My latest coveted possession is a bright orange bag. It is the same shape as their bouncy castle tote, but it has a clasp at the top to do it up. It also comes with two little pouches. These are instead of pockets sewn into the bag. I must admit, I wasn’t sure about the idea of separate pouches instead of pockets sewn in. But as a mum, it has been a godsend. Take last night for example. Half way through eating packets of fruit, the girls went off to a dance class. So, I chucked the fruit into one of the pouches, the fruit all fell out of the packet and the pouch got messy. But the bag didn’t! Because this is made from vinyl PVC, you can just wipe it clean. No fabric liner to mess about with, no need to put it through the washing machine. I just tipped out the grotty fruit, wiped the pouch and chucked it back in the bag. Before my orange bag arrived, I was using a bouncy castle tote instead of a handbag. They’re really only designed for putting shopping in as there’s no clasp, but I just love it! It’s really sturdy and a fabulous colour. 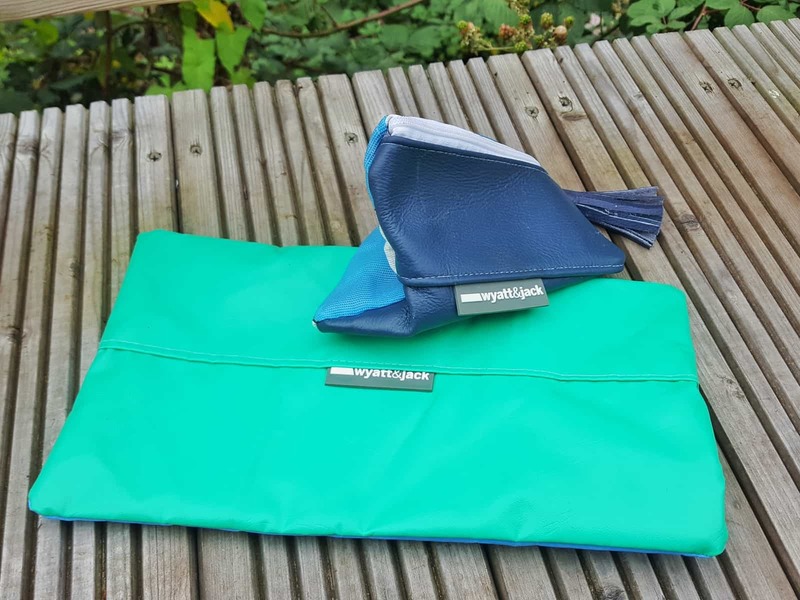 Perfect as a reusable shopping bag – but also ideal for gym or swimming kit – or as an emergency handbag while you wait for the perfect one to appear. 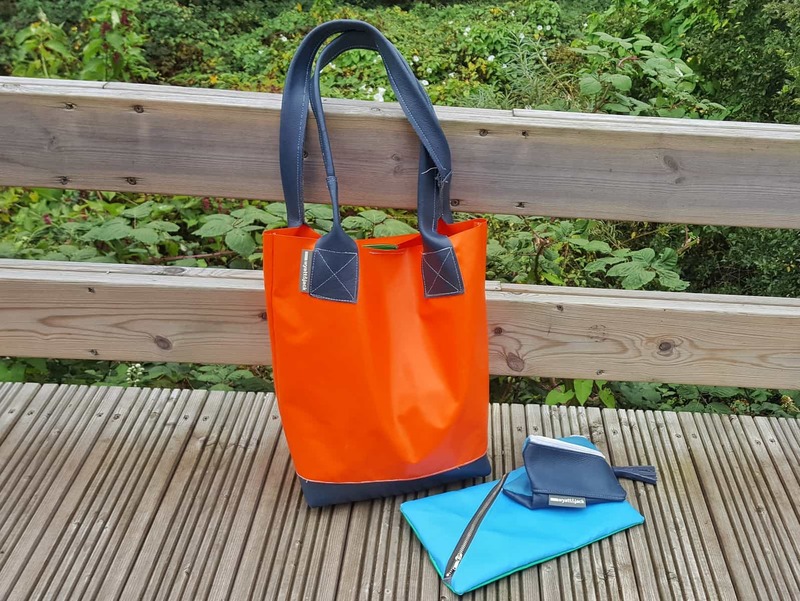 Wyatt and Jack have kindly agreed to give one lucky reader the chance to win one of these gorgeous totes. The prize is a dark blue bag the same as the one in the photo. If you’d like to win it, you can enter using the Rafflecopter below. Please read my competition terms and conditions before entering. Don’t forget to check out my other competitions too, there are some brilliant prizes up for grabs. 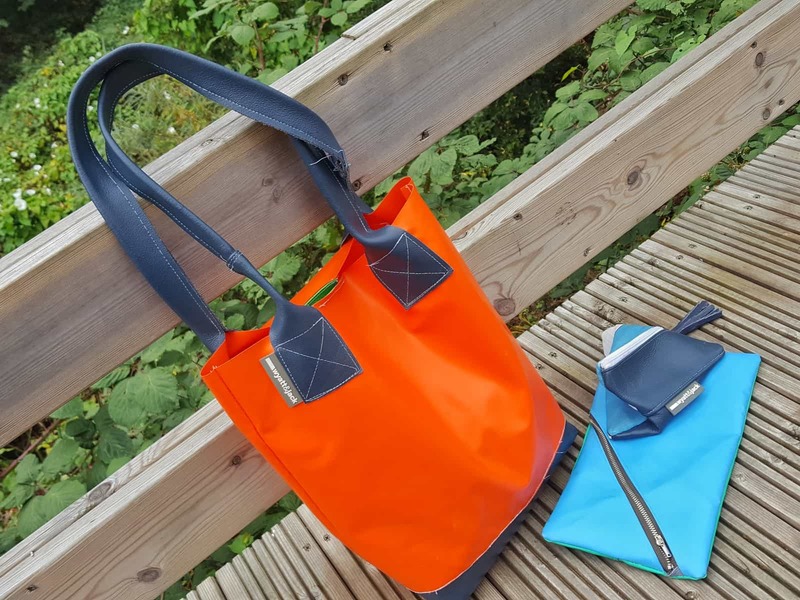 Please note, the bespoke bag and tote were sent to me for the purpose of an honest review. All views and opinions on the products and rants about consumerism are my own. I’d love to add the Angel ltd edition tote to my Christmas list! These look fab! I especially love the bike tote. I’m amazed I haven’t heard of this company. Not only am I into recycling and sustainability, I also live on the Isle of Wight! The limited edition Ines especially the one with the animals on. https://www.wyattandjack.com/collections/all-products-recycled-deckchair-canvas-bags/products/t-o-t-e-s-l-t-d-e-d-i-t-i-o-n Love the tiger one. Love the Deckchair Totes and great that they are made of recycled canvas. The oversized tote would be so useful. The Little Tote would look great for carrying my stuff to the gym. Love their little totes, and also the tangerine bouncy castle tote. Fab range of colours. the limited edition totes. the one with the dog on it.